Product code: R792 Categories: Sold Items, Sold Rings. There is nothing more special than an engagement ring adorning your finger and there is nothing quite like a genuine 1930’s Art Deco diamond engagement ring such as this one here. 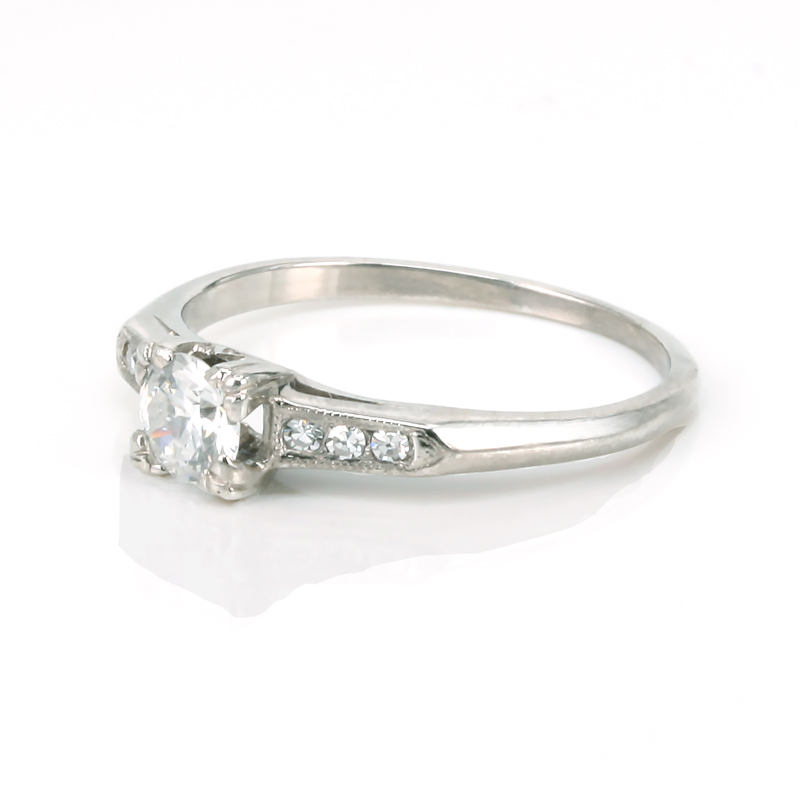 So elegantly designed, this Art Deco engagement ring was hand made in platinum and set with a central diamond with three more diamonds running down each side. The centre diamond measures 0.32 carats and is F in colour and Si in clarity and being such a lovely white diamond and well cut, it sparkle and looks amazing set into the platinum. The side diamonds total 0.06 carats and add the right amount of sparkle to the ring and from where one side diamond begins across to the other side, this distance measures 14.7mm across by 4.8mm wide in the centre. Able to sit perfectly against a wedding ring, this Art Deco diamond engagement ring is so attractive and special and will make any woman proud to wear it and say “Yes!” when offered this and asked the big question. A fabulous engagement ring from a fabulous bygone era.